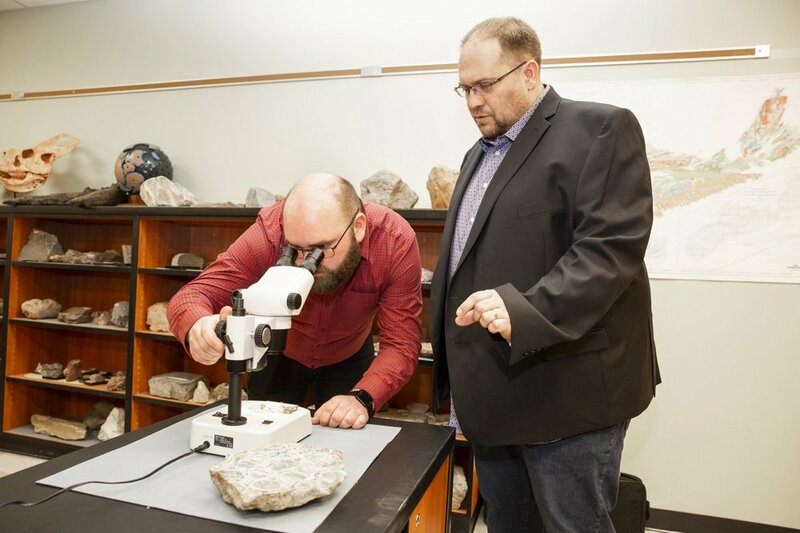 Businesses, prospectors and researchers now have more support for innovative projects in the mining sector as the result of a provincial government announcement at Saint Mary’s University. As part of Budget 2019-20, the province is increasing the Mineral Resources Development Fund by $800,000 to a total of $1.5 million. Energy and Mines Minister Derek Mombourquette opened the fund to applications in an event at Saint Mary’s on April 9. Saint Mary’s University Professor Dr. Jacob Hanley and PhD student Kevin Neyedley received $47,500 from the fund in 2018. They are working on research and gathering geological information about how strategic minerals formed. This will help identify where deposits may be located and then extracted with minimal environmental impact. “It is vitally important for Nova Scotians to have access to the most current scientific knowledge, gathered using cutting edge research tools,” said Dr. Hanley. “Our research can help attract companies by reducing exploration costs for industry and reduce the impact that grass-roots exploration has on the environment through narrowing the size of mineral deposit targets,” said Mr. Neyedley. Last year, the province supported 28 projects including mineral exploration programs, professional development, innovation, university research and training opportunities for young people. Thirty years ago, the legendary cast of CODCO paved the way for a renaissance in Canadian comedy writing and performance. Often controversial, occasionally furious, but always hilarious, CODCO took gleeful pleasure in lampooning the hypocrisies of the powerful. Saint Mary’s University will host an unforgettable evening on Friday, March 15th as Andy Jones, Cathy Jones, Greg Malone and Mary Walsh come together again to revisit their best work in a panel discussion on the art and politics of satire. They are the featured guest speakers for the 2019 Cyril J. Byrne Memorial Lecture, in the McNally Theatre Auditorium. The public event begins at 6:30 pm with a live performance by the Evan Mahaney Jazz Trio. Starting at 7:00 pm, the four comedians will review their favourite sketches from CODCO’s television run, and reflect on the lasting significance of their work. The panel discussion is followed by an audience Q&A and a reception. CODCO’s writing and many of its audacious performances continue to be studied today. Originally founded in St. John’s as a theatre company, CODCO aired nationally on CBC from 1988-1993 as a weekly sketch comedy television program. Far ahead of their time, Walsh, Jones, Jones and Malone – along with their beloved co-performer Tommy Sexton – were masters of social satire. With The Kids in the Hall, they pushed Canadian comedy, and Canadian culture as a whole, into new territory by tackling many previously taboo subjects relating to gender, sexuality, religion, economic development, colonialism and corporate / political power. The annual Cyril J. Byrne Memorial Lecture celebrates the life and the fun-loving spirit of literature professor Cyril Byrne, who passed away in 2006. Throughout his 35-year career at Saint Mary’s, Dr. Byrne played a major role in establishing our Atlantic Canada Studies Program and the D’Arcy McGee Chair in Irish Studies. The lecture has welcomed many of the world’s best writers to Halifax, such as Yann Martel, Anne Enright, Richard Ford, Alistair MacLeod, Anne Carson, Colm Tóibín, Dionne Brand, David Adams Richards and Wayne Johnston. As always, the lecture is free and all are welcome, but seating is limited. Online registrations are now closed and early arrival is recommended for all who submitted RSVPs online. An overflow seating area with a video link has been arranged in Scotiabank Auditorium. Saint Mary's University's recently hosted an engaging public panel discussion, that serviced as a precursor to the Halifax International Security Forum three-day annual conference. The panel, entitled Discord, Disruptions, Disorder: A World Without International Institutions, took place on November 15th in the McNally Theatre Auditorium. The event is the result of a partnership between the Halifax International Security Forum, Dalhousie University and Saint Mary's. Mercedes Stephenson, host of The West Block on Global News, moderated the discussion. Daouda Sembene, former Executive Director of the International Monetary Fund. “As a city with a truly global outlook, Halifax is a fitting site for this esteemed gathering of thinkers and problem solvers,” said Dr. Robert Summerby-Murray, President and Vice-Chancellor of Saint Mary’s University. “We are extremely proud to host this year’s very timely public debate over the future of our global institutions. The Halifax International Security Forum is an independent, non-profit, non-partisan organization based in Washington, DC.